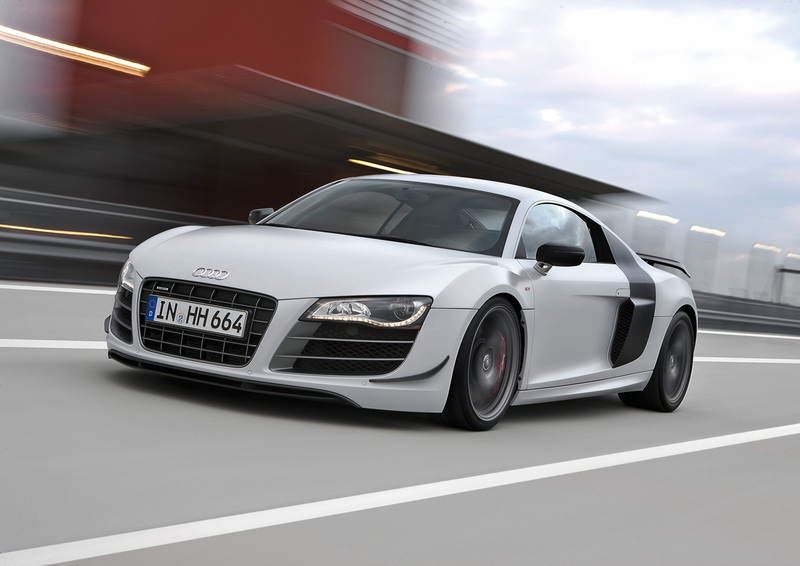 The R8 has always been the comparatively bargain-priced Lamborghini Gallardo, especially with the advent of the new V-10. The R8 uses the same 5.2L V10 as the Lambo, except it has been detuned a bit so as not to cannibalize sales of the Gallardo. We always knew that sometime, Audi would pull out the stops and create a version with the Gallardo’s balls-to-the-wall, tuned-out V10…and here it is! It’s called the R8 GT. Using lighter-weight materials, engineers from ze Germany have the GT down 220 lbs and up to 560 horsepower, an increase of 35 horsies from the traditional V10. Limited edition – Only 333 of these beautiful beasts will be produced, so the states will be lucky to get even a few outside of the Axis Powers. The pricetag – $256,000 according to today’s Euro-to-Dollar exchange rate. Ouch! That’s more than the base Gallardo! How Will I Tell if I’ve Seen One? Back – looking at it from the rear (we won’t judge), look for the vents right behind the read wheels. Front - If you have the rare opportunity to see one from the front, look for the small chin-wing spoilers. So, here’s the question. Considering that for $198,000, you can get the base Gallardo with the same amount of power, is actually lighter, and is a Lamborghini, would you consider the R8 GT over it? Bryan Cochran on May 3, 2010 at 8:12 pm. wilcoxaj on May 3, 2010 at 8:15 pm. Thanks Bryan, that’s great info, right from the horse’s mouth.